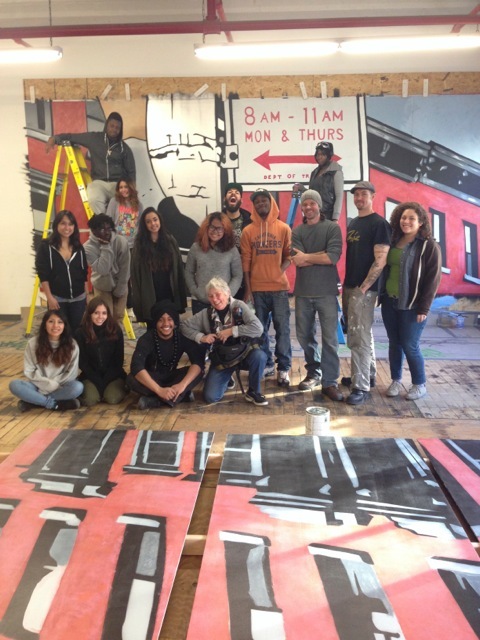 Please join us for a studio visit on Sunday, March 23, from 1 pm to 3 pm to view the production of Sign Language, a mural being produced by Cre8tive YouTH*ink apprentices under the guidance of teaching artists Chris Stain and Billy Mode. Come check out the progress of this large-scale mural at our Industry City Studio and enjoy an afternoon of snacks, refreshments, and of course lots of art. Meet Chris Stain, Billy Mode, Mista Oh and the young apprentices in the Art School Without Walls crew. Call Jerry Otero at 718-664-7420 for more details. Cre8tive YouTH*ink is a non-profit creative arts youth development organization. Using elements of developmental psychology, attachment theory, social justice youth development, and critical pedagogy, we collaborate with arts professionals to design projects that revive the spirit of apprenticeship in the arts, pairing creative urban youths with top artists, journalists and technical professionals in the making of real works of art.